Allana has a special gift for working on bodies. Her talented and skilled touch offers one a unique blend of depth and sensitivity in her therapeutic massage. Allana Noury is a Licensed Massage Therapist in Hawaii and was formerly approved by the Board of Massage in Vermont. Allana has been a resident of the Island of Molokai for 39 years. Allana offers 35 years of experience in Massage and Natural Remedies. 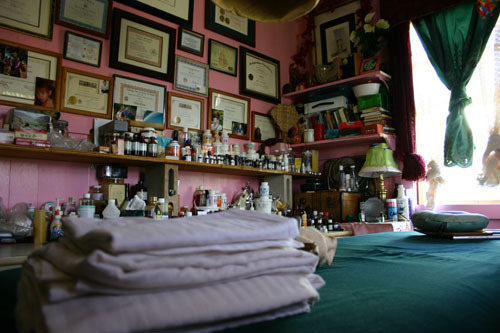 A Master Herbalist, Master Iridologist and working with Essential Oils for over 25 years. She adds her knowledge of mind and body to her sessions. Trained in Lomi Massage under Kumu (teacher) Noelani Moss, her specialty integrates modalities of long strokes, or gentle explicit rhythms, deep tissues, structural integration, and joint mobilization, taking the massage experience to a new level. Incorporating Reflexology, Cranial Sacral, Myofacial Release, Polarity, Swedish, PNF, and Stretches, checking for Huli-Opu (twisted stomach) integrating a standard of excellence that will encourage you to embrace your body, spirit, and life's journey. Allana will reason your health from cause to effect, and also offers consultations in health, plant medicine, Hydrotherapy, and Colon Therapy. She has lectured and given classes in the states of Hawaii, New Hampshire, California, Vermont, and Alaska. Previously she was the owner of an herbal apothecary business and is the current owner of Molokai Apothecary. Allana is a former board member of the Chamber of Commerce, former member American Botanical Council, former member Herbal Research Foundation, former VP AMTA state of HI. Allana is also available for consultations on herbal walks, lectures, body work, etc.